Celebrate the Fourth of July in the best way possible: On the beach, of course! Specifically on one of the beautiful beaches of the modern U.S.’ first state. It doesn’t get more patriotic than that, and nothing beats watching a sparkling fireworks spectacle with a bucket of caramel popcorn from Dolle’s or a Kohr Brothers ice cream cone with extra, extra sprinkles in hand. Below are the Independence Day celebrations you’ll find along Delaware’s coast. 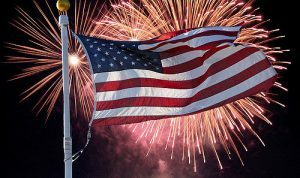 For a full list of all the celebrations throughout DE, check out the events on VisitDelaware, and if you’re trekking south to Ocean City, Maryland on the Fourth of July, here’s a handy guide to the holiday in OC. Stake out your spot in Bethany Beach on Wednesday for the town’s biggest party of the year. The parade starts at 12 p.m. at the intersection of Pennsylvania Avenue and Garfield Parkway, and 12 bands — including a pipe band, a National Guard Army Band, the Downtown Dixieland Band, a German Oompah Band and more — will be walking the streets of Bethany to a highly-diverse range of sounds. At 7:15 p.m. there will be an awards ceremony on the Bandstand followed by a Love Seed Mama Jump concert at 7:30. Fireworks begin at dusk. Enter your own float in the parade between 9 and 11:30 a.m. on July 4 near the Christian Church grounds. Collectors t-shirts of the 2018 parade will be available 9 a.m. – 12 p.m. on the 4th at the Christian Church entrance. Head on over to Bethany or Lewes on the Fourth for an Independence Day spectacular, and if you’re looking to celebrate a few days early, Rehoboth is the place to be. On Sunday, July 1 there will be a fantastic fireworks display at 9:15 p.m., launched from the beach south of Rehoboth Avenue and visible up and down the boardwalk and beach. Depending on the weather, the fireworks may be launched any time after 8 p.m. The Funsters will be performing in concert on the Rehoboth Bandstand from 8 – 9:15 p.m., breaking for the fireworks and returning at 11 p.m. The City of Rehoboth recommends visitors use the Dart Park & Ride to get downtown. In-town parking options include the North Rehoboth Deauville Beach Lot – fee per car until the lot is filled, and the metered and non-metered fee permit parking spaces throughout town. Join the City of Lewes for their annual Old Fashioned Fourth of July celebration from 9 a.m. – 10 p.m. The day begins with old-fashioned games for children at 9 a.m. on 2nd Street, during which time 2nd Street will be closed to traffic. Following the games, the Lewes Independence Day Boat Parade will wind its way down the Lewes – Rehoboth canal from the Roosevelt Inlet to Fisherman’s Wharf.The parade entrants will leave from Roosevelt Inlet across from the Coast Guard Station at 1:30 pm and at approximately 2 pm they will pass in front of the judges’ reviewing stand and turn before reaching the Savannah Road Drawbridge. The awards ceremony will take place on the deck of the Lightship Overfalls at 3:30 pm. The fun continues with the unique and quirky Doo-Dah Parade that forms in the vicinity of Lloyd’s Market on Savannah Road and winds its way down Kings Highway to Second Street and ends on Savannah Road, heading back towards Lloyds. No preregistration is required and everyone is invited to participate. Finally, the day caps off with fireworks that will be shot from a barge off Lewes Beach at dusk. The best visibility is from Roosevelt Inlet to the Cape May-Lewes Ferry terminal.